The longest-tenured Phillie joined forces with one of his newest teammates on Friday, helping Philadelphia avoid its first 0-5 start to a season in 82 years. Instead, Ryan Howard homered, Vince Velasquez delivered six shutout innings and nine strikeouts and the Phillies grabbed a 1-0 win over Bartolo Colon and the Mets. Velasquez, whom the Phillies acquired in the seven-player Ken Giles deal with the Astros in December, became the first Phillie to strike out nine-plus batters in his debut since Roy Halladay in 2010. And it wasn't just the strikeouts. 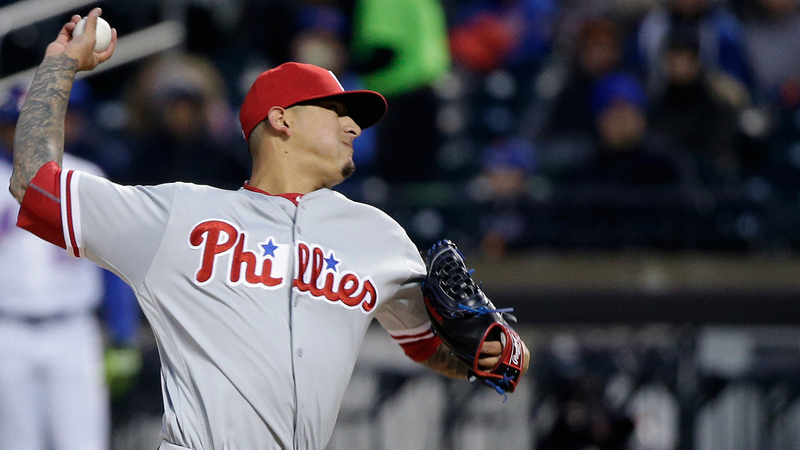 Velasquez kept the Mets off-balance all evening, scattering three hits and three walks over six innings. "I think he threw one of his best starts of his career," Mets outfielder Yoenis Cespedes said through an interpreter. "He was spotting his pitches and everything seemed to work out." Colon, making his first start of the season, was also plenty sharp, retiring 12 of the first 13 batters he faced with six strikeouts. But Howard's homer leading off the fifth was enough to prevent Colon from earning his 219th career win, which would have tied him with Pedro Martinez for the second-most ever by a Dominican-born pitcher. With more offensive support, Colon might have enjoyed a different fate; as it was, the Mets mustered just three hits on a damp, cold night at Citi Field. Cespedes in particular struggled, his 0-for-4 night dropping him to 2-for-16 with seven strikeouts on the season to elicit scattered boos from the crowd. "It's tough to swing a bat on cold nights," Mets manager Terry Collins said. "The pitcher has a distinct advantage. But we haven't swung the bats very good yet, so we're not going to make any excuses about how cold it was. We've got to swing the bats better." Howard hurts Mets: When Howard homered off Colon to lead off the fifth inning, it was his 45th career home run against the Mets, tied with Hank Aaron for the fifth-most of any player. The four ahead of him are all big names: Willie Stargell (60), Chipper Jones (49), Mike Schmidt (49) and Willie McCovey (48). "That's some rarefied air," Howard said. The Mets lost a 1-0 game on a home run for the first time in 12 years, and just the 23rd time in 55 seasons. They had not dropped such a game since Sept. 19, 2004, when Humberto Cota homered off Aaron Heilman in a 1-0 Pirates victory. Phillies: Jeremy Hellickson, who didn't allow an earned run in six innings on Opening Day in Cincinnati, gets the start Sunday at Citi Field at 1:10 p.m. ET, before the Phillies get ready for their Monday home opener against the Padres. Hellickson beat the Mets the only time he faced them last season, when he was pitching for the Diamondbacks. Mets: Matt Harvey returns to the mound for the Mets' series finale against the Phillies Sunday, looking to improve upon his 5 2/3-inning, four-run performance Opening Night in Kansas City. Harvey is 6-1 with a 2.44 ERA in eight career starts against the Phillies, who won just one game at Citi Field last season.